August is a great month to start thinking about Liatris! The meadow at the Arboretum in August is a spectacular array of deep purples and lovely greens. The Liatris, a native Texas flower, will begin to bloom in August and show its lovely blossoms through the month. 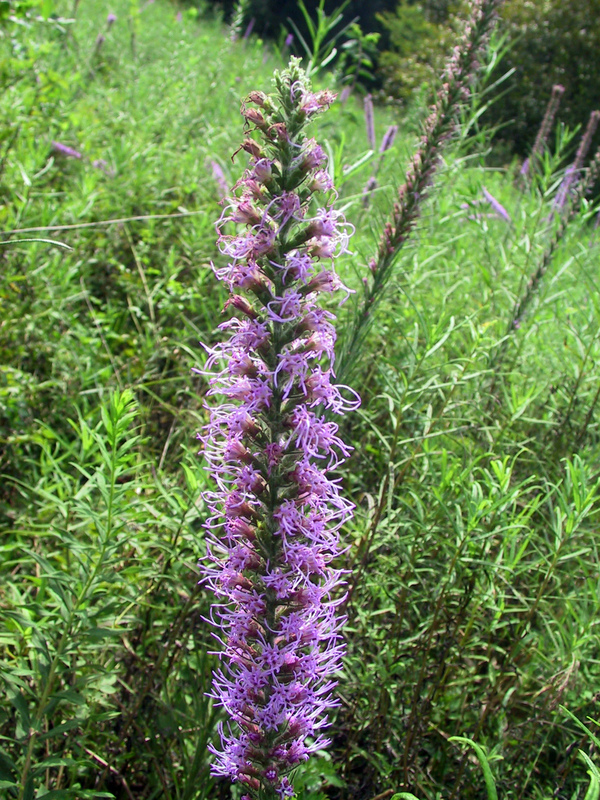 Also known as the Blazing Star, the Liatris boasts feathery stalks of bright pink-purple or white flowers from attractive grassy tufts of foliage. 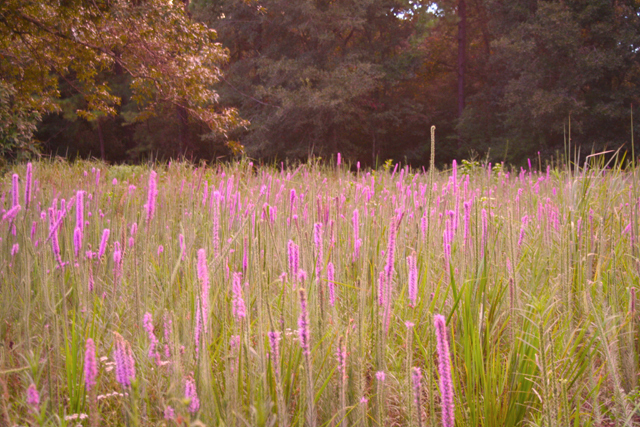 This time of year the meadow at the Houston Arboretum will be buzzing with the hum of pollinating insects like bees and butterflies who are attracted like magnets to the Liatris flowers. It is an amazing native garden plant in warmer climates like ours here in southeast Texas. I highly recommend it in home gardens. It is a sturdy, beautiful plant that provides many benefits to the landscape. If you would like to check out Liatris before you decide to plant it feel free to come check it out in person at the Arboretum. It will be in full bloom in August in our meadow! One thing to keep in mind, the plant may be hard to find in garden stores. If you come across Liatris in your local plant nursery, the most common species you will find is Liatris spicata, however, if you want to select the species native to this region look for Liatris pychnostachia (which may be harder to find but worth it). Liatris is a hardy zone 3 plant that thrives in hot full sun. If the plant is positioned in a sunny spot with good drainage and no standing water, it will not disappoint. Plant Liatris any time from early spring to mid-summer for blooms in the same season. If you start the plant from a corm it will flower for you the first year, planting later in the season will give you beautiful flowers the next fall. If you plant from seeds be warned it may take up to 2 years for it to give you flowers. The seeds are very small and will take more time and patience than planting from corms. What are corms you ask?? Corms look like bulbs, but contain a solid mass of stem tissue, rather than the concentric rings of leaves found in the bulbs of onions, tulips, and garlic. Other examples of corms are the gladiolas, crocus, and banana. This plant is close to fail-proof for any gardener. Liatris is a great garden addition because it grows easily and it provides a habitat for beneficial insects who will pollinate your garden for you. It does well in hot climates reducing the need to be watered frequently. It is resistant to pests and diseases making it a sustainable option for any yard. Besides being a sensible plant, it is also large and beautiful and will make you look like a master gardener! Liatris makes a great flower for cut arrangements. 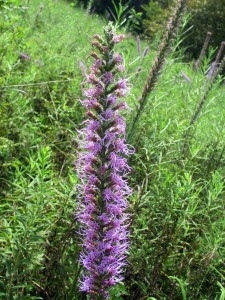 The Liatris blooms from the bottom up which is unusual for flowers in general but common for upright spiked flowers. If you want to cut some Liatris from your yard you can put it in a vase and since the flowers bloom up the stalk you can cut the stem towards the bottom as they begin to look spent. This way the flowers last much longer in your house. Liatris has a heavy duty stem so wilting will be less of an issue. Make sure not to plant the Liatris corms more than 2 inches deep. If planted too deep it may not grow properly. Make sure the plant is not going to be in a spot where standing water could occur. Have fun with it!